Most people who cook regularly know that broccoli has a relatively short shelf life. If you get it from a local grower (soon after harvesting)…or happen to get an unusually fresh head at the grocery store…you might be able to keep it for a week before it starts to turn yellow. But that’s pretty unusual. Most of the time it needs to be used up fairly quickly. I’ve been thinking about this kind of thing as I have begun to adjust my cooking routine to accommodate food for one. In general, cooking for one starts with smart shopping. Whenever possible you purchase produce in smaller/one serving quantities. When that isn’t possible, spreading out the timing and manner of use is the way to keep yourself from feeling like you’re having the same thing every night. So, for things like root vegetables (or winter squash) that keep well, it is an easy thing to use a small amount of the whole one night and then a few nights later use some more in a different way…and then, if there is still some left, make something else a few nights later. Unfortunately, things that are not that shelf stable (broccoli…)—AND that generally can’t be purchased in smaller quantities (broccoli…)—present a challenge. Because I cook for a living—and I love to cook—I have seen this as a challenge that is well within my comfort zone. It is also beneficial in that it is forcing me to get out of a few of my more well-worn cooking ruts. 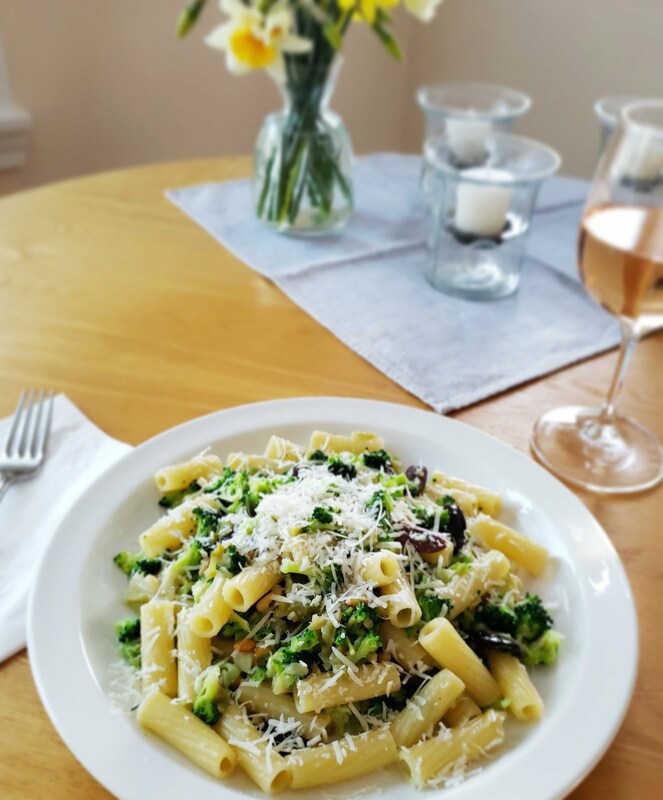 The first thing I tend to make with a head (or crown) of broccoli is of course pasta. I have two or three favorite recipes that I could happily eat one or the other of every time I purchase broccoli (even if that happens to mean every week). 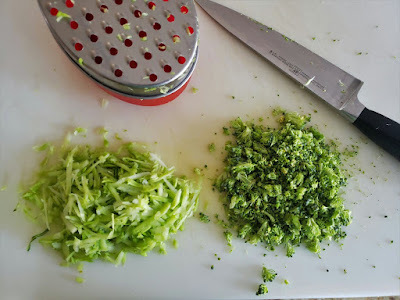 When I was cooking for two I would take a head of broccoli, make enough pasta for two (plus a bit extra so there would be a little something leftover for someone’s lunch) and if there was any broccoli left after the pasta I would add it to a salad…or grain pilaf…or just use it for a simple vegetable side. But a couple of weeks ago when I was on my second head of broccoli (maybe I should have purchased something other than broccoli the second time around…but it looked good when I was at the store…) and had made all my usual suspects, I knew I was going to have to come up with some new ideas. While poking around on line I had seen a recipe for a large root vegetable pancake for one that I was considering making with some carrots I had on hand. But of course the carrots will keep and I had broccoli burning a hole in my produce bin.… But the pancake made me think of the chard fritters I posted last summer. 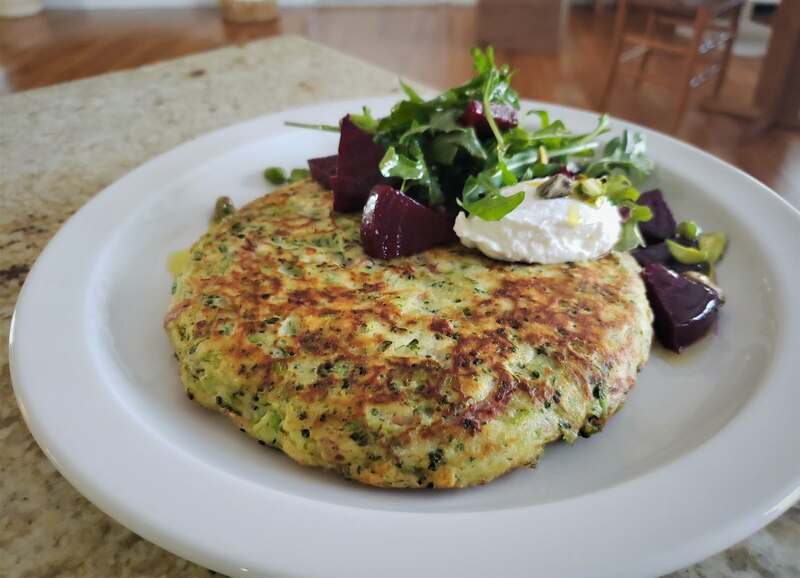 It occurred to me that broccoli would make a nice fritter too…and that I could easily make the fritter batter into one large pancake. For the chard fritters, the chard is blanched and squeezed out. Since blanching broccoli would introduce too much water (you can’t squeeze it out) and make for a gummy pancake, I cooked the grated stems and chopped florets in a little bit of olive oil in a sauté pan instead. 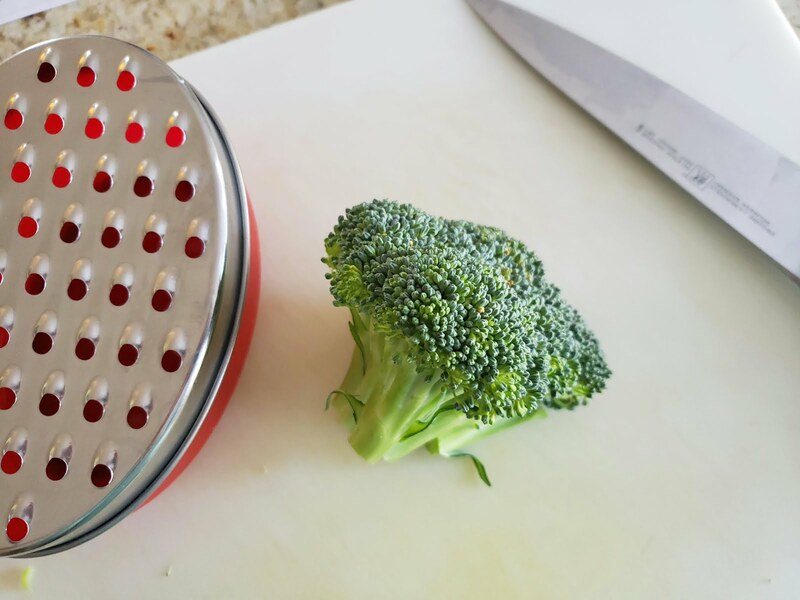 This softens the broccoli without turning it to mush. 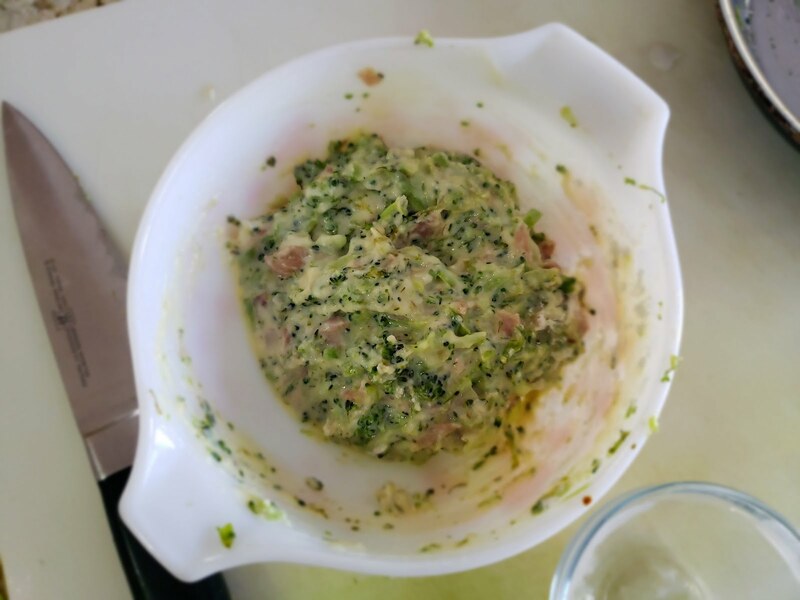 I then folded the cooked broccoli…along with a bit of julienned prosciutto…into a thick egg-rich (for loft), ricotta-based batter. It made just enough to fill a 6-inch non-stick skillet with a half inch (or so) layer of the batter. 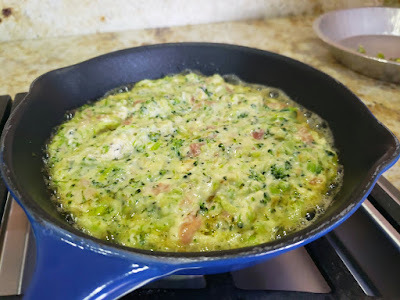 But you could of course make small pancakes (as in the chard fritter recipe), too. And I should also point out, you can multiply this recipe to make pancakes for any number of diners (just keep them in a low oven while you cook them all). 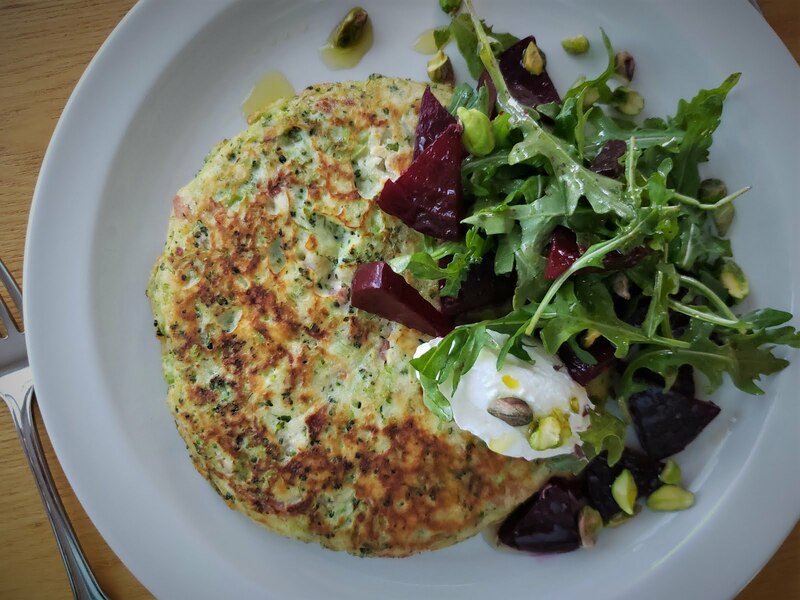 I served the pancake with a blob of labneh (but thick/Greek yogurt would be fine if that’s what you have) and a roasted beet and arugula salad. I think any tangy vegetable salad or relish (grated carrot, summer tomato, etc) would be good. The broccoli pancake was a fantastic way to use the last of my broccoli. It was light—but had plenty of substance and filled me up. Best of all, it was delicious. In fact, I liked my pancake so much I went out and bought another head of broccoli… True story…. Using the large holes of a box grater (or similar) grate the broccoli stems. Roughly chop the florets, medium fine. Heat a tablespoon of olive oil in a small sauté pan set over medium to medium-high heat. 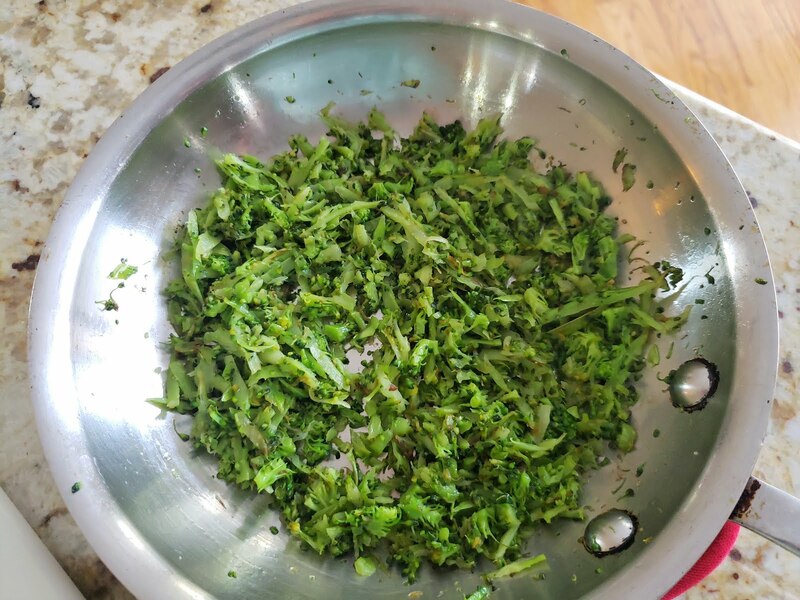 Add all of the broccoli along with good pinch of salt and let it sizzle, stirring occasionally until it has cooked down a bit and is just tender—four or five minutes. If it seems dry at any point, add the remaining half tablespoon of olive oil. Set aside to cool. Crack the egg into a bowl and whisk to break up. Add the garlic, ricotta and milk and whisk until smooth. 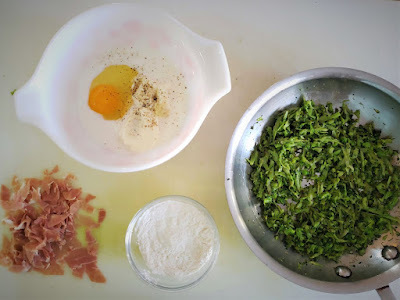 Fold in the broccoli and prosciutto. Combine the flour and baking powder and fold in. Taste and correct the seasoning with salt. Heat a 6-inch non-stick skillet over medium-high heat. Film the pan with olive oil and add a teaspoon or so of butter. 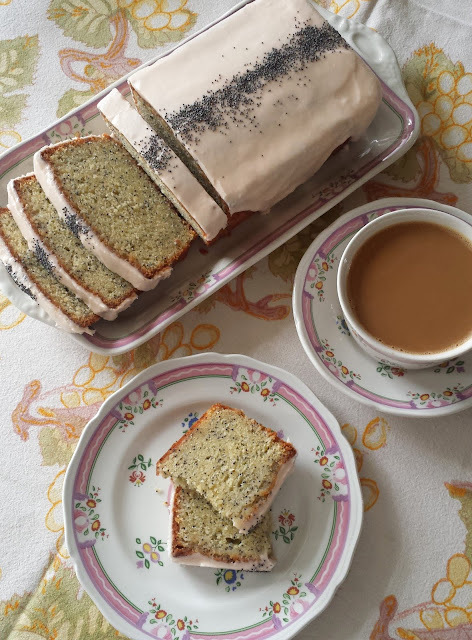 When the butter melts and the foam subsides, scrape in the batter and use a spatula to spread it out into an even layer (it should be about a half inch thick). Regulate the heat as necessary to maintain a gentle sizzle, but don’t allow the pancake to scorch. When set on the first side (after about 3 minutes), simultaneously tilt the pan and slide a pancake turner/spatula under the pancake. Carefully turn the pancake over and continue to cook until the pancake is cooked through…another three minutes. If multiplying the recipe, transfer the pancakes to a platter or baking dish as you make them, keeping them in a warm oven while you finish the remaining pancakes. Serve warm with a dollop of labneh/thick yogurt and a salad of spicy greens and/or vegetables.